I find it interesting that as I work on my proposal at my job for a Superman Day Event in the Library, that all of this Man of Steel News comes out today. And there is a lot of news folks! Where to start? Well first off, we got new photo stills from the film! There’s a really cool pic of General Zod (you must kneel before him!) played by Michael Shannon, and there’s two pics of Superman-one of which he’s flying. There’s also a picture of his parents-real and adoptive. We see Russell Crowe who plays Jor-El and Kevin Costner and Diane Lane who play Jonathan and Martha Kent. Last but not least we get a glimpse of Clark’s co-workers at the Daily Bugle-his boss Perry White played by Laurence Fishburne, and Lois Lane played by Amy Adams. You can check the photos out throughout this article. But there’s more! New details are emerging about the film. In the latest issue of latest issue of Entertainment Weekly, which is set to hit stands this week, Man of Steel director Zack Snyder and Jeff Robinov, president of Warner Bros. Pictures Group, both spoke to EW about the film delivered some interesting details about the film. Let’s start with what Robinov had to say. 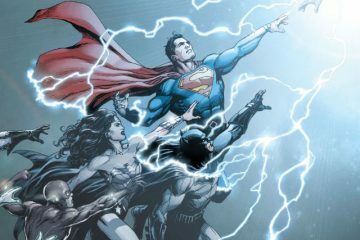 Besides marking the arrival of the new Superman, when Man of Steel hits theaters on June 14, it it will also lay the groundwork for the future slate of films based on DC Comics. “It’s setting the tone for what the movies are going to be like going forward. In that, it’s definitely a first step.” How are they going to do that? Let’s hope so. I’ve said this a while ago but if this film doesn’t do well (which I cautiously doubt) then dreams of seeing other DC films and a Justice League movie are history. So fans will at least get a hint at other potential heroes in the film but not an overt introduction. It might be along the lines ow what we saw in Batman Begins, where one of the Joker’s calling cards were seen but he wasn’t. Robinov’s comments are intriguing and fans are going to dwell on his words for while. I think that Nolan’s trilogy was just that a trilogy-it had a good beginning and amazing middle, and an okay ending (IMO). So that’s done. I wonder if we’ll see another person in the bat suit if JL gets made. Could it be a certain person who played a character named John Blake who’s real name is Robin? Time will only tell. Here’s another spoiler brought to you by EW. They saw footage of the film and apparently as baby, Kal-El is special even on his doomed home planet of Krypton, where his birth is said to cause alarm among some citizens. So Superman’s specialness isn’t just limited to him getting his powers from our yellow sun. So my fellow comic book and movie fans, what are your opinions on all this glorious news? Let us know in the comment box below! Man of Steel opens June 14. Willingham’s FABLES To Become A Movie? They’ve released a couple of new trailers in the last week or so! I’m beyond excited for this movie!